I think this sandwich is the best thing that’s ever happened to me (okay…after my meal at Jean-Georges). I can’t wait to whip up another batch of the lentil mixture. It’s filling but not heavy, full of nutrients, and just plain good. Start by preparing the lentils. Rinse them and then cook until al dente in a pot of boiling water. I used green lentils, which are my current favorite because they don’t taste like cardboard and they are easy to find in any grocery store! You could really go for any lentil here, though, so don’t be shy about those red or brown lentils lurking in the back of your pantry. Use them! Meanwhile, toast your nuts. 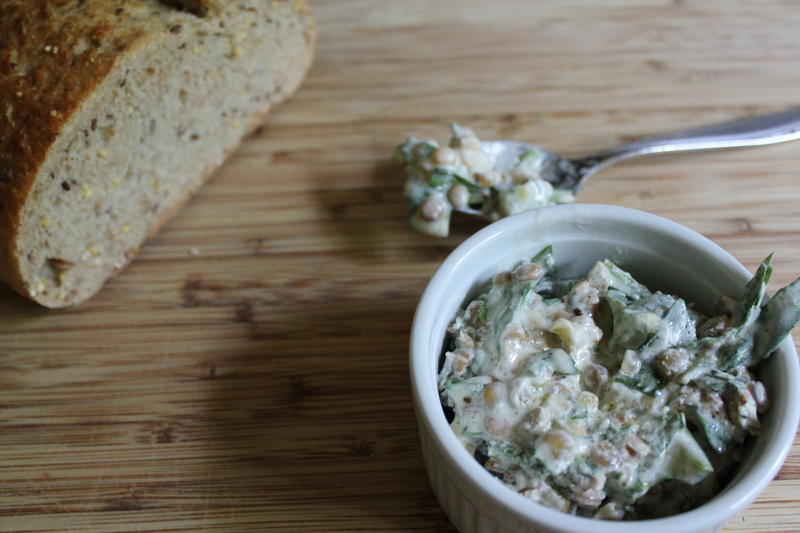 I used walnuts, which I chopped ahead of time; you could use a different nut if you prefer, such as pine nuts or maybe cashews, or if you are allergic to nuts, even sunflower seeds. Go for broke. Nuts are great! I do recommend buying them raw and unsalted, which allows you to avoid extra added oils and to season the way you like them. You could toast on the stovetop (as I did) or dry roast them in the oven. You could even leave them raw if you like that better. If you used walnuts, don’t forget to rub the skins off after roasting, because they are both bitter and unsightly. When the lentils are cooked, drain off any excess liquid and combine them in a large bowl with Greek yogurt, olive oil, lemon juice, salt, black pepper, and the chopped greens. Finally, stir in the chopped toasty nuts. I love to broil a few slices of bread rather than toasting, because the bread really gets a nice crispness on the top edges while the underside stays a bit softer. You can brush with olive oil or not, as you choose, but make sure if you broil your bread that you check it every minute or so, because it can blacken quickly. I was using a whole-grain artisan loaf from the grocery store, and it was perfectly toasted after about 4 minutes. Spoon the lentil mixture over the toasted bread. Top with parmesan. NO, YOU MAY NOT use the powdered parmesan in the green can. That stuff tastes about as delicious as licking the green can. Do us all a favor and buy either the freshly grated tubs in the cheese section of the grocery store, or better yet an actual wedge of real parmesan that you can shave or grate freshly in your own kitchen. I topped my sandwich with some fresh ground black pepper for a little extra kick. And then I went back for seconds. Yum! Rinse the lentils and combine with water in a small pot. Bring to a boil, then simmer for 20–30 minutes, until al dente. Meanwhile, heat the oven to 350°. 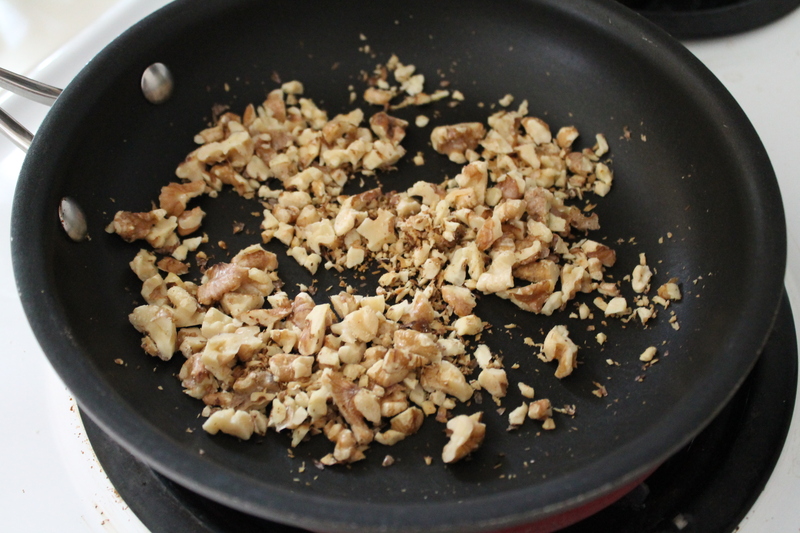 Dry roast the walnuts for 8–10 minutes, shaking or turning the pan halfway. Rub the browned nuts in a tea towel to remove the skins, and then chop into pea-size pieces. 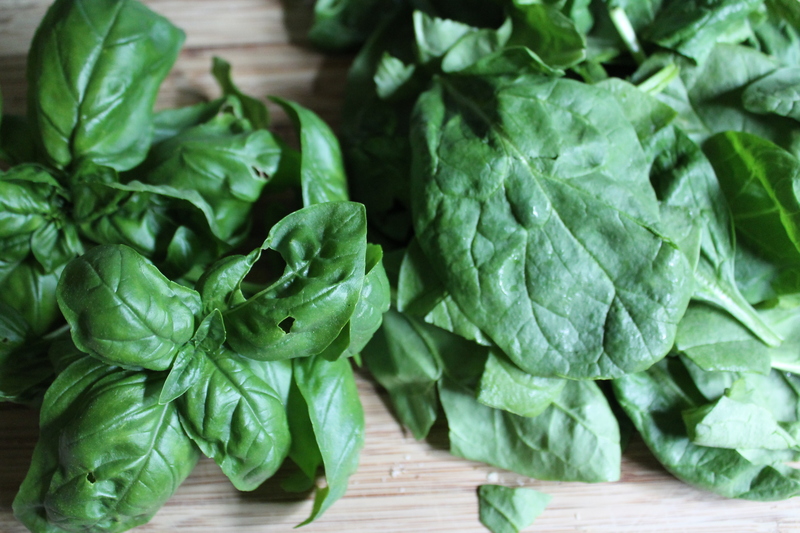 Carefully chop the spinach and basil into bite-size pieces with a very sharp knife. Finely chop the parsley. 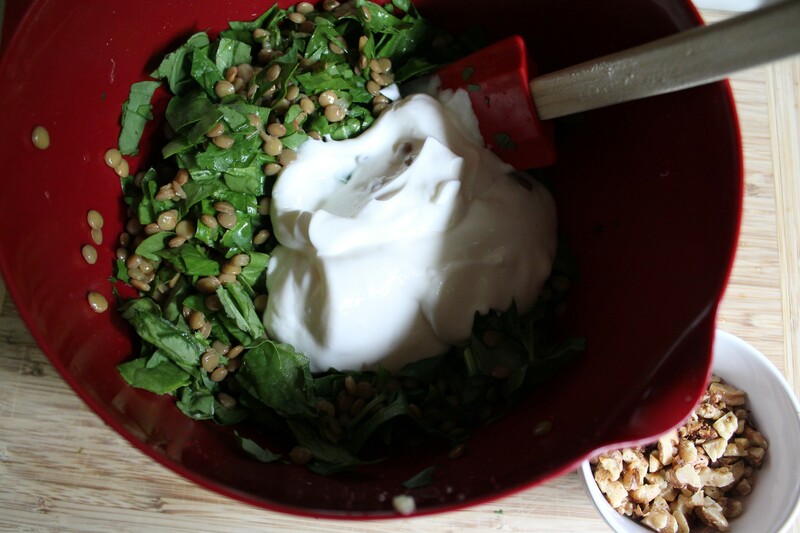 Place the cooked lentils in a bowl and mix in the spinach, basil, parsley, and garlic. Add the yogurt and squeeze half of the lemon into the mixture. Mix again, and then pour in the olive oil, stirring to combine. At this point, taste the mixture and season with salt, pepper, and extra lemon juice as needed. Finally, fold in the roasted nuts. 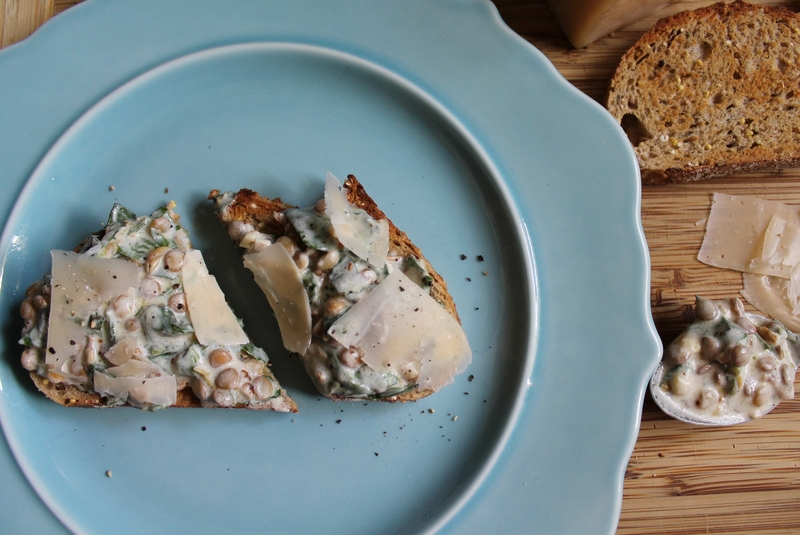 Toast the bread or broil in the oven for 2–4 minutes. Spoon the lentil mixture over top. 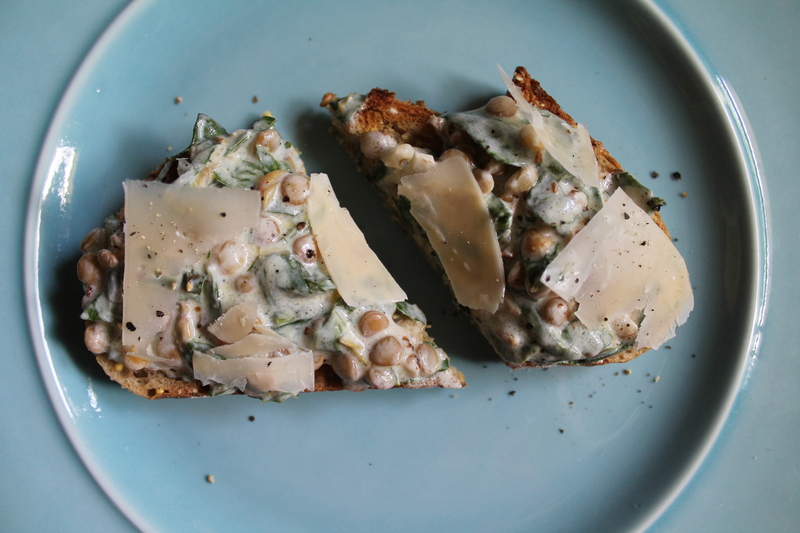 Shave or grate the parmesan generously over the lentils and finish with a few grinds of black pepper.